(and the short haul too). PACK MULE CART TUGGERS offer the best value pound-for-pound. PACK MULE's NXG Cart Tuggers are powerful performers designed for just-in-time towing applications. Available in multiple configurations including sit-down and stand-up models. Whether you require powerful burden carrier tuggers or highly maneuverable stock chaser tuggers, Pack Mule offers a superior solution to increase productivity in any warehouse or facility. Towing Capacity up to 8,000 pounds. QUICK SHIP is Now Available for many PACK MULE Vehicles! Specifications PDF 35.5" 18" Front 30" Rear 1,000 LBS. 74.5" EXTRA LENGTH INCREASES DECK SPACE BY 25%. The BC-520 is 7″ wider and offers 336 sq. inches more deck space than the BC-500, but with the same tight turning radius, substantial deck weight capacity (1,000 lbs.) and towing capacity (2,000 lbs.). Specifications PDF 35.5" 18" Front 48" Rear 1,000 LBS. 92" EXTRA LENGTH CREATES LARGEST DECK SPACE FOR OPERATOR SEATED TUGGER! The BC-620′s extra length provides great deck space (2,343 sq. in.) but also requires a little extra turning radius. Specifications PDF 31.5" 19.5" 750 LBS. 63.5" THE CHOICE FOR SIT-DOWN 2,000 LBS. TOWING IN TIGHT SPACES! 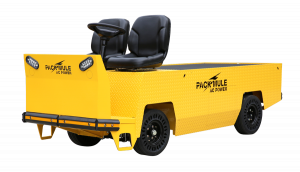 The PC-325 is only 32″ wide and has a tight 63.5″ turning radius, making it ideal for towing in very tight passageways. Specifications PDF 35.5" 18" Front 53" Rear 1,000 LBS. 80" LARGEST DECK SPACE & CAPACITY WITH 2,000 LB. TOWING. The BC-625 combines the largest deck space (a whopping 2,520.5 sq. in.) and towing capacity (2,000 lbs.). Specifications PDF 31.5" 48" 1,000 LBS. 55" MAXIMUM CARGO DECK & MINIMUM TURNING RADIUS! The SC-775 combines the largest cargo deck (1,890 sq. in. with the free 60″ deck length upgrade) with the minimum turning radius (55″) of any stand-up tow vehicle. Specifications PDF 31.5" 19.5" 750 LBS. 63.5" JUST LIKE THE PC-325 BUT WITH 5,000 TOWING. The PCT-3250 can serve as either a personnel carrier or a tow vehicle for towing up to 5,000 lbs. Specifications PDF 31.5" 21.5" 750 LBS. 76" COMBINES NARROW FRAME & TIGHT TURNING RADIUS! The PCT-3500 is the choice for some of the nations largest package delivery services. Specifications PDF 37.5" 18" Front 25" Rear 1,000 LBS. 79" TIGHTEST TURNING RADIUS FOR A SIT DOWN TUG! The PMT-4500 is the choice for making milk runs in lean manufacturing plants where space is tight and maneuverability is important. Specifications PDF 35.5" 18" Front 30" Rear 1,200 LBS. 74.5" ADDED DECK SPACE & CAPACITY WITH 5,000 LB. TOWING. The BCT-5200 delivers great deck space (1,704 sq. in.) and towing capacity (5,000 lbs.). Specifications PDF 35.5" 18" Front 48" Rear 1,200 LBS. 91" EXTRA DECK SPACE! The BCT-6200 (with either bucket or bench seat) provides great deck space (2,343, sq. in.) and capacity (1,200 lbs.) as well as 5,000 lbs. of towing capacity. Specifications PDF 35.5" 18" Front 53" Rear 1,200 LBS. 80" LARGEST DECK SPACE & CAPACITY WITH 5,000 LB. TOWING. The BCT-6250 combines the largest deck space (a whopping 2,520.5 sq. in.) and 5,000 & 6,000 lbs. of towing capacity. Specifications PDF 31.5" 48" 1,200 LBS. 55" TIED FOR TIGHTEST TURNING RADIUS – DRIVER BEHIND THE DECK! The SCT-7750 is the choice for making milk runs in lean manufacturing plants where space is tight and maneuverability is important. Specifications PDF 31.5" 48" 1,000 LBS. 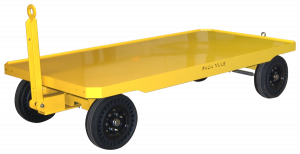 55" TIGHTEST TURNING RADIUS – INDUSTRIAL BATTERY FOR RAPID AND OPPORTUNITY CHARGING! The SCT-7750-IB, designed specifically for a major auto producer, is the only Stock Chaser style vehicle on the market with an industrial battery capability, allowing it to be charged during brakes and keep running through all three shifts. Specifications PDF 36.5" 15" 500 LBS. 55" TIGHTEST TURNING RADIUS – DRIVER IN FRONT! The PMT-5000 is another top choice for making milk runs in lean manufacturing plants where space is tight and maneuverability is important. Specifications PDF 35.5" 21.3" Front 25" Rear 1,200 LBS. 80" HEAVY DUTY TOWING – INDUSTRIAL BATTERY FOR RAPID AND OPPORTUNITY CHARGING! The BCG-6200 was designed specifically for a major auto producer to accommodate an industrial battery capability, allowing it to be charged during brakes and keep running through all three shifts. 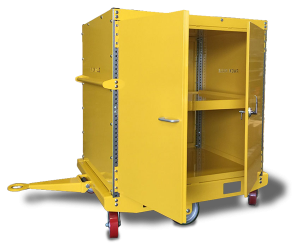 PACK MULE offers the BEST PERFORMING Towable Carts, configured to your needs.